Presented on its own, a graph depicting the sharp increase in global temperatures in recent years isn't particularly beautiful. But artist and scientist Jill Pelto has found a way to transform alarming climate change data into gorgeous, watercolor landscapes, Smithsonian reports. 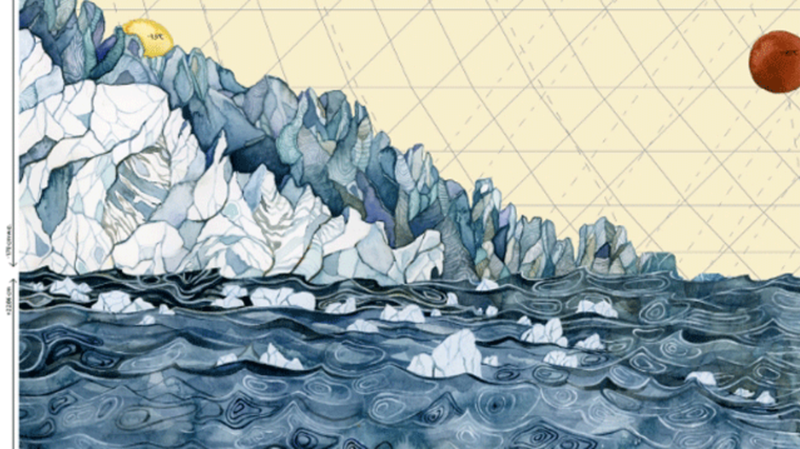 Her project, titled "Glaciogenic Art," takes line graphs showing data like dwindling glacier mass balance and rising sea levels and fills them in with relevant scenes from nature. In "Salmon Population Decline," a group of flailing fish swim down the length of a graph colored in tranquil blue, and in "Habitat Degradation: Deforestation," a plummeting line representing rainforest loss separates a tiger from his home. Some paintings combine multiple graphs. "Landscape of Change," for example, pulls data on sea levels, glacier volume, rising temperatures, and fossil fuel use to build a colorful and jagged horizon. "I think that art is something that people universally enjoy and feel an emotional response to," Pelto said in a recent interview with Smithsonian. "People across so many disciplines and backgrounds look at and appreciate it, and so in that sense art is a good universal language." The 22-year-old recently graduated from the University of Maine with a double major in Studio Art and Earth Science. She plans to return to the university to pursue her Master's in climate science next fall and is interested in collaborating with fellow scientists on more art pieces in the meantime. With global temperatures hitting an all-time high last year, finding creative ways to raise environmental awareness is more important than ever before. You can view more of her scientific works of art below and purchase prints by contacting her through her website. "Habitat Degradation: Arctic Sea Melt"
Images courtesy of Jill Pelto.